The fire pit at The Broadmoor's Fly Fishing Camp. Photo credit The Broadmoor. The Broadmoor Resort, nestled in the shadow of Cheyenne Mountain in Colorado Springs, is perfect for whatever getaway you have in mind. From a little romance to a family vacation to a girls’ weekend away, it’s an all in one resort. 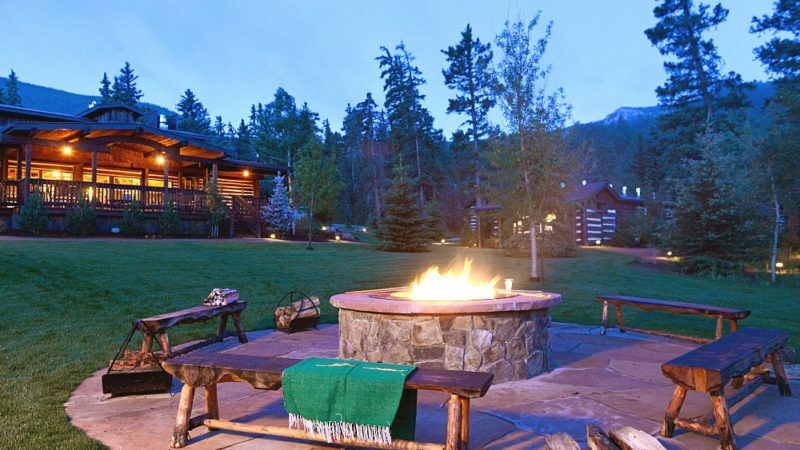 Plus, it’s got all the amenities you’d expect from a luxury Colorado resort. Add on their Wilderness Experiences and Adventures and you’ve just turned your vacation up a notch, complete with endless possibilities for luxurious adventure and exploration. 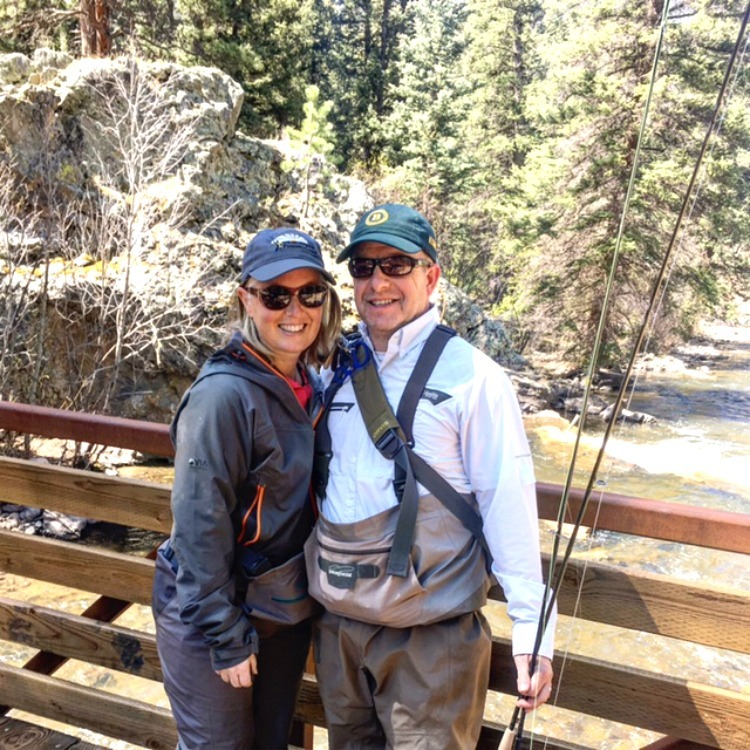 Enjoying together time at The Broadmoor fly fishing. Photo credit Dana Zucker, Luxe Traveling Mom. 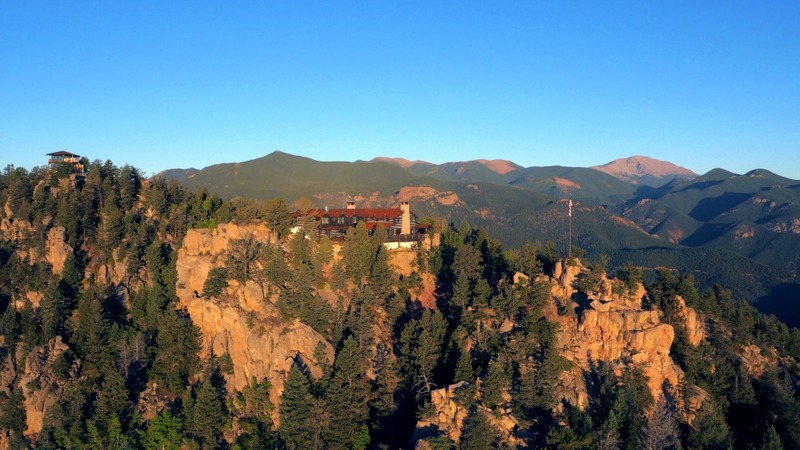 Is The Broadmoor a Luxury Colorado Resort worth the Experience? I’m always looking for a resort that offers luxury accommodations, above first class service, a top rated spa, world class food, special experiences and adventures, and the ability to do everything or nothing at all. I don’t ask for much. But, trust me, it’s not always an easy task. Plus, finding a getaway that is is perfect for everyone and every purpose can be hard, too. Since we planned a Colorado visit recently, a friend suggested we visit The Broadmoor. After realizing it was in the perfect location, we discovered they also offered a Fly Fishing Camp, my husband’s favorite hobby. I knew this had to happen. With the combination of a luxury resort and luxury adventure, the fact that you never have to leave the resort, the natural beauty of the American West as a backdrop, and over 300 days of sunshine each year, I give you a perfect vacation. First of all, everything anyone could possibly want can be found on the grounds of The Broadmoor. From the pools, lake, and hiking trails to an amazing spa for the grown-ups and tons of activities for the kids, you will never be bored. And, if you are looking for golf, the three award-winning courses staffed by pros should please. In 2018, the resort will even host the U.S. Senior Open for the USGA. You can also take bikes from the outfitters, paddleboat from the docks, and so much more. Any traveler will find the perfect room type at The Broadmoor. We stayed in one of the many suites that the resort offers. In addition to the regular rooms, there are thirteen types of suites, 5 room types, cottages, brownstones, and even an Estate House. We found it hard to leave the room because our suite was simply beautiful and so comfortable. The sitting area, with a fireplace and french doors, looked out over the lake. We opened our doors, enjoyed a breakfast in the room with the fireplace, and could watch the sun on the mountain all day. Most of all for me, the food is a story in itself. The Executive Chef, David Patterson, is only the sixth Executive Chef in the Broadmoor’s near 100-year history. His team of 25 world renowned and trained chefs, as well as the hundreds of staff on the team, assure everything, and I mean everything, is housemade. An amazing colorful array of veggies at The Broadmoor. Photo credit Dana Zucker, Luxe Traveling Mom. Chef David comes to the Broadmoor after many years of working at Michelin Star restaurants and hotels. 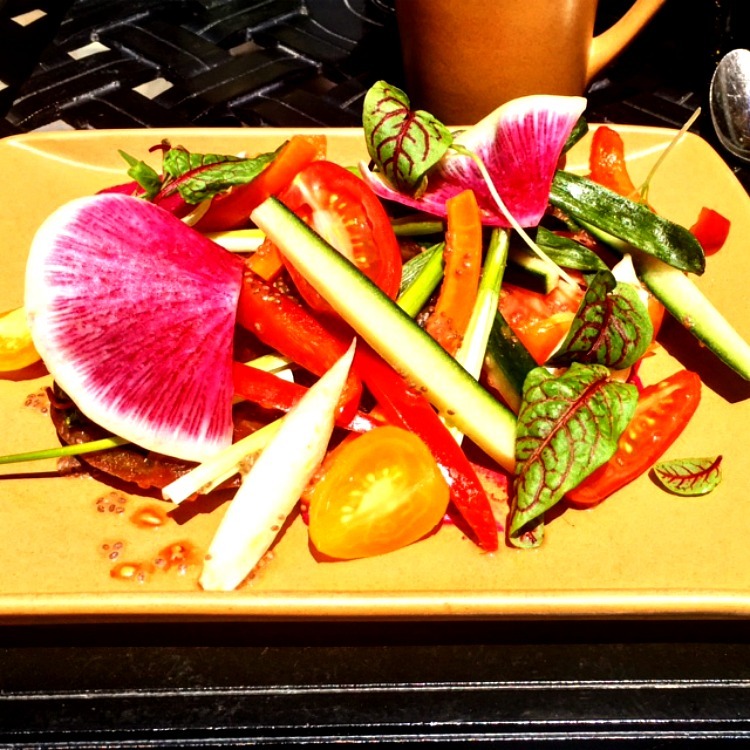 He brings with him a philosophy of farm-to-table food with high standards of excellence. Most incredible is the national recognition and invitation to cook at The James Beard House he received for his work with small farmers at the Hotel Hana in Maui. Subsequent world travels served as the influence for the culinary experience you will find at The Broadmoor. What I am most excited about at the resort are their 3 Wilderness Experiences you really must check out. Each distinctive Wilderness Experience features its own unique lodging, dining, and activities. But, while these experiences may be called Wilderness, they are truly luxury camps. 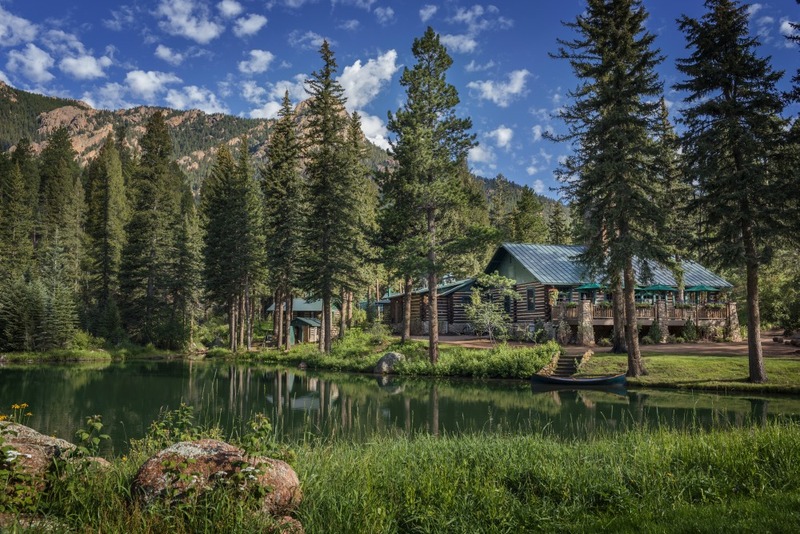 You choose between Fly Fishing Camp, Cloud Camp, or the Ranch at Emerald Valley. We first stayed at The Broadmoor proper, but then traveled to the Fly Fishing Camp which was beyond wonderful. Since this is my husband’s latest passion, I could not have chosen a more perfect getaway. And, of course, this means we are already trying to plan a trip back. 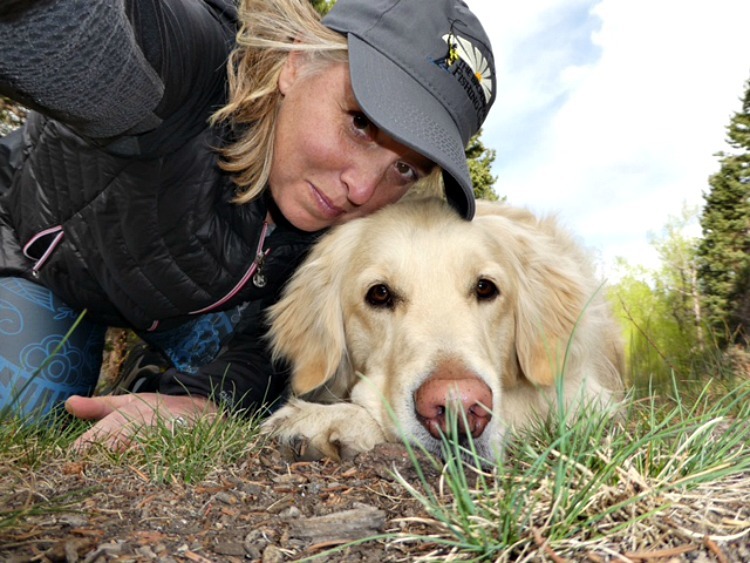 Me and Blue having a moment during fly fishing camp at The Broadmoor. Photo credit Dana Zucker, Luxe Traveling Mom. We arrived at the camp and our bags were whisked away to our “rustic” cabin where we got suited up to head out to fish. Your adventure begins when you arrive and does not end until minutes before you leave. It is the only fly fishing adventure we have been on where we stayed out on the water as long as we wanted. Back in the lodge, we enjoyed cocktails and conversation before dinner with fellow fly fishers, chatting about our day on the water with our guide and Blue, the camp dog. With our cocktails came a delicious appetizer of smoked trout dip and veggies. We were served dinner family style that consisted of Broadmoor wagyu perfectly cooked, cedar plank trout, and so much more. It was topped off with carrot cupcakes. All food comes from kitchens at the resort. After dinner, you can meet up with the Fly Fishing Director, Scott, for a fly tying lesson, but we chose bed! The morning comes early with coffee/tea and then a delicious and hearty breakfast fit for a morning on the water. Can you believe this is dinner at fly fishing camp? Photo credit Dana Zucker, Luxe Traveling Mom. We spent the day on the water, minus a quick trip back to the lodge for lunch. We hit many different spots and caught beautiful rainbow trout, native brown brooks, and a few others. Most exciting to me was working with our guide, Blake, who taught me so much! But, a very special day was when I decided to come in early from fishing and found myself in the kitchen with the team making watermelon cocktails. Best of all, Fly Fishing Camp is relaxed and low key with top notch service and amazing guides who all really feel like friends. The accommodations are in rustic cabins. Three of the cabins are en-suite while the others share a beautiful bathhouse. Each cabin has unique features, like one has a porch over the water that I would most likely never leave. We will be back. Hidden high up on Cheyenne Mountain and another 3000 feet above the resort is Cloud Camp. I am told you get a view of Pikes Peak like no other and the 360-degree views are to be some of the best in the world according to CNN Travel. Tucked away in this lodge with rooms and eleven additional cabins. Book the cabins. There are 2 bedroom cabins for families, with all the luxuries of The Broadmoor. Stunning views await from The Main Lodge at The Broadmoor’s Cloud Camp. Photo credit The Broadmoor. Cloud Camp is a place to unplug, hike, and be spoiled. You can do as little (porch sitting and hot tubbing) or as much (hiking and pre-dinner cooking club) as you want. Honestly, I want to go for the food and yoga, but I would also like to visit just for the experience of getting there. You can enjoy a luxury ride, a mule, or a three-hour hike. While you may be 3000 feet above The Broadmoor, you will dine in style and some say even grander than at the Penrose Room. Dinners are still served as they were back in the 1920s to Spencer Penrose and his Cooking Club with wine, of course. Dishes include Maine Lobster Bisque, Roast Duck, carved Leg of Colorado Lamb, produce from The Broadmoor gardens, Beignets, and so much more. Yes, Emerald Valley is a ranch, but unlike any other ranch we have been to or heard about. Just a bit up the mountain from The Broadmoor, The Ranch at Emerald Valley combines rustic charm surrounded by over 100,00 acres of Pike National Forest with, of course, The Broadmoor luxury. Most notably, the days at the ranch can be as full or empty as you choose. You can fly fish and get fly fishing instruction, horseback ride twice a day, kayak, canoe, and so much more. The ranch is made up of 10 luxury cabins from one to three bedrooms. All have fireplaces and I hear you could spend all day just relaxing in your cabin. Experience the beauty of nature at The Broadmoor’s Emerald Valley Ranch. Photo credit The Broadmoor. The food at the ranch is a bit different than some at The Broadmoor. Staff source the foods from the Colorado and Rocky Mountains, including wild berries. 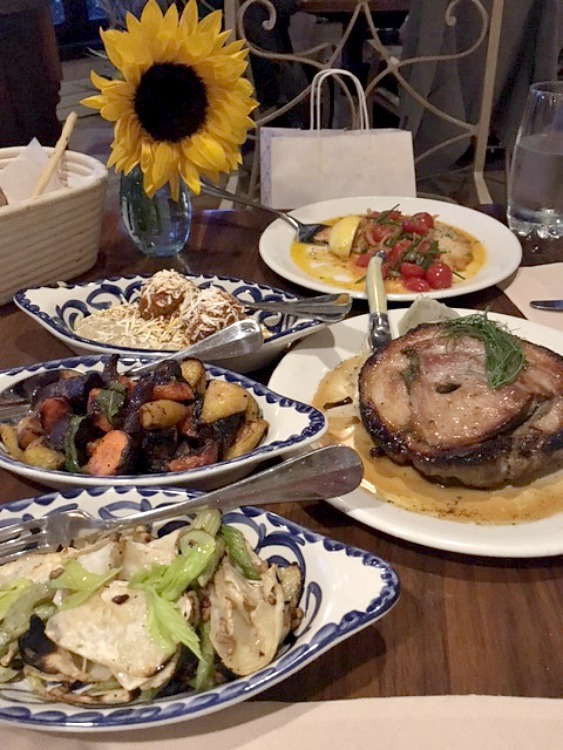 Menu items include Eagle Nest Wagyu, Rocky Mountain Red Trout, local Hickory Smoked Ham, and, of course, S’Mores among other wonderful desserts. Seriously, the Ranch at Emerald Valley offers one other experience like no other, The Elk Glade Cattle Drive. It is a true “city slicker” experience. Although it’s an additional fee to your all-inclusive stay at the ranch, it is one I would add on in a heartbeat. But, then again, I am all for turning it up a notch! 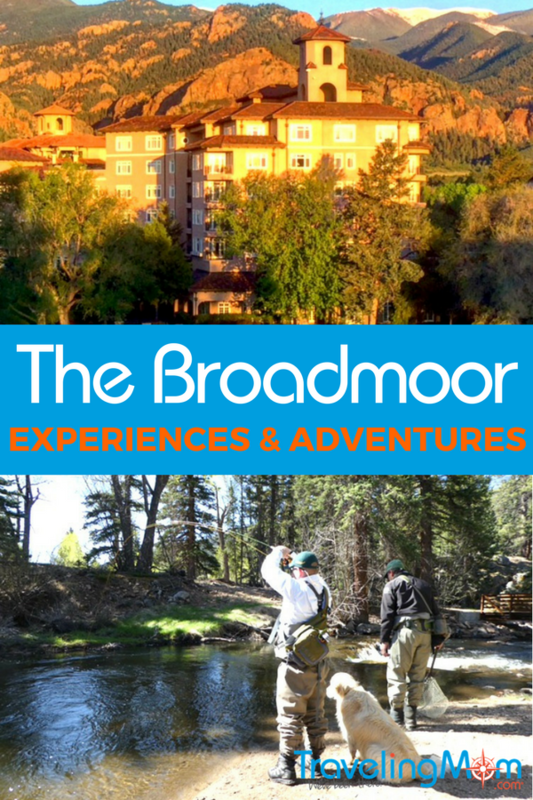 In addition to the Wilderness Experiences, The Broadmoor offers 3 adventures, just in case you like a little adventure with your vacation. 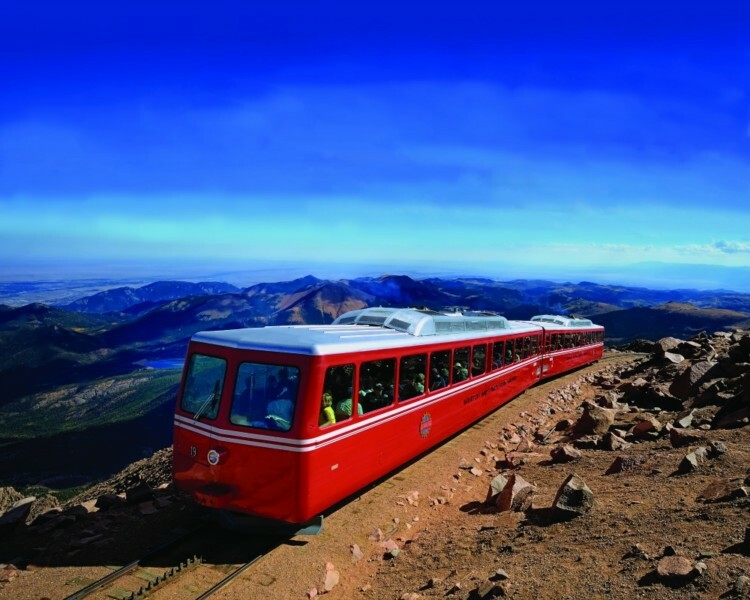 Choose Soaring Adventures over Seven Falls to scenic train rides up Pikes Peak. All of the adventures are operated by Broadmoor Outfitters and they are more than happy to find the right adventures for you and your crew. You may have to purchase tickets on-line, but the staff will help you get it all done. These are all day trips from The Broadmoor Resort. The Soaring Adventure is made up of two courses or you can combine them for a longer day of adventure. The full tour lasts about four hours. Both courses are made up of five lines that get longer and longer. On the Woods Course, you will fly over the trees, waterfalls, and a natural granite arch. 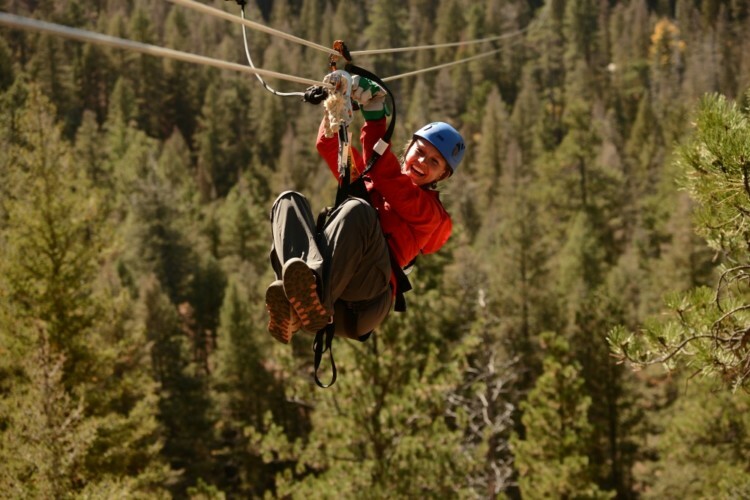 Ziplining on the Woods Course at The Broadmoor. 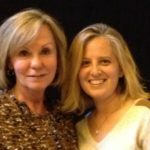 Photo credit The Broadmoor. The Soaring Adventure ticket also includes entry to Seven Falls. Ticket prices range from $140 to $242 for the four-hour tour and the price includes gratuity for your two guides. Each tour is limited to 8 people and weight restrictions are 90-250 pounds. Bring sunscreen and wear closed-toe, comfortable shoes. While The Broadmoor may be turning 100, Pikes Peak Cog Railway is 125 years old. After boarding the one-of-a-kind train, travel across all the different types of life zones in the area, even spotting wildlife along the way. The nearly 9 miles of track take you from the Canyon to “Hell’s Gate,” better known as the entrance to the mountains, with beautiful views of the natural surroundings. Stunning scenery awaits on the Cog Railway Adventure. Photo credit The Broadmoor. The trip is wonderful for everyone in your group. In the summer, lines can get long for the bathrooms and food at the top, so plan accordingly. Pick up lunch or a snack and enjoy it on the train on the ride back down. Only one waterfall in Colorado has earned a spot on the National Geographic list of International Waterfalls and it is Seven Falls. We took a nice hike to the base of Seven Falls, about a mile from The Broadmoor. But, you can also take the shuttle to the Falls. We understand the 224 steps to the top is well worth it to see the streams that feed the falls. If you don’t want to take that hike, no worries. Luckily, you can take a leisurely walk on the walking trail and do some shopping and grab a bite at Restaurant 1858. 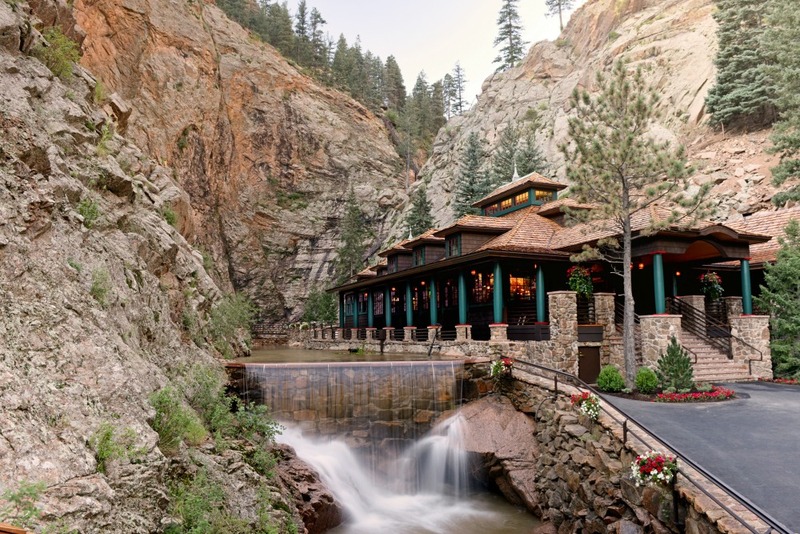 Grab a bite at Restaurant 1858 at Seven Falls. Photo credit The Broadmoor. Ticket prices start at $8 for children age 2-12 and $14 for those over 13. Seven Falls does close during inclement weather. A gift shop is on property. We highly suggest taking the shuttle as parking is limited. What is your favorite thing to do at The Broadmoor?